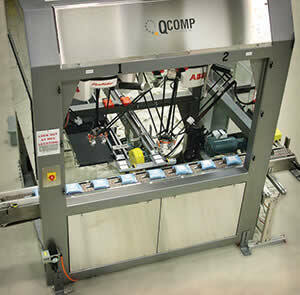 QComp's High Speed Lid Applicator maximizes the throughput of your lidding application. In addition to handling a wide range of lid types, the cell features the flexible delta style robot. Single and dual cells delivered with speeds up to 180 picks per minute. The QComp servo lid feed conveyor ensures precision pick and placement of the lids for the highest accuracy in the industry. (Patent pending). Easy operator focused controls to keep your system running. QComp's LPSX Technology is an innovative inspection feature now available as a standard option on our Lid Applicator cells. The LPSX Technology feature maximizes production by allowing an operator to inspect the glue pattern on the lid without interrupting the production process.